The beginning of V7476 history in Australia started at the beginning of 1941 when the Prime Minister of Australia, Robert Menzies, during his visit in London expressed his fears about defence abilities of his homeland. Great Britain treated Australia as a source of recruits and training centre for units later sent to fight the Third Reich. Unlike Winston Churchill, Menzies saw the threat posed by more and more aggressive Japan. That is why he wanted Great Britain to equip RAAF fighter squadrons in Australia with modern fighters. He even suggested sending modern fighters to RAF squadrons in the Far East. But Churchill did not want to listen to this and claimed that Australia could only be the training centre for RAAF squadrons in Africa and Europe. He also told them to abandon the idea of forming fighter squadrons as they did not have commanders and pilots trained well enough to serve in such units. Hurricane Mk I trop V7476 painted with Temperate Land Scheme, Photo was taken on 29 August 1941 over Laverton/Melbourne. Pilot: Group Captain Allan Leslie “Wally” Walters. Photo: Australian War Memorial, public domain. Finally the government in London decided to send one aircraft to Australia. It arrived on 23rd August 1941 and was sent to Central Flying School in Camden near Sydney. The Royal Australian Air Force Command wanted to show its pilots, who had never seen and flown modern fighter plane. It may sound strange but at that time the air defence of Australia based on Bristol Bulldogs and CAC Wirraway (a training aircraft converted into a “fighter”). In Camden it stayed until the middle of 1942 when it was transfered to 2 Communication Flight and in July 1942 to 1 Aircraft Depot in Laverton. There it underwent some modification to test pneumatic anti-G suit designed by Prof. Frank Cotton. After a few months of testing it was allotted to 1 Communication Flight in Laverton where it stayed until the end of December 1944. In January 1945 V7476 was sent back, for a short time, to Central Flying School, that time in Point Cook , Victoria. This time it was as a curiosity (at that time RAAF used more modern Spitfires, Mustangs and P-40s). In 1946 it was scrapped. When V7476 reached Austraila it wore typical RAF camouflage from the beginning of the war. Upper surfaces were painted Dark Green and Dark Earth (in this case the B Pattern). Lower surfaces were painted Sky. According to available information there were no roundels on the lowerwings. In the second half of 1942 it was repainted and the new scheme was, the most probably, Foliage Green and Earth Brown on upper surfaces and Sky Blue For many years it has been shown and described as painted Foliage Green but the RAAF General Aircraft Instruction No. C11from July 1942 required all operational aircraft being painted Foliage Green and Earth Brown. As at that time V7476 was in 1 Aircraft Depot implementing this instruction is logical. Although existing photos are not very clean they reveal demarcation lines between the two camouflage colours. What is interesting, during repainting the original camouflage B Pattern was changed to A Pattern. 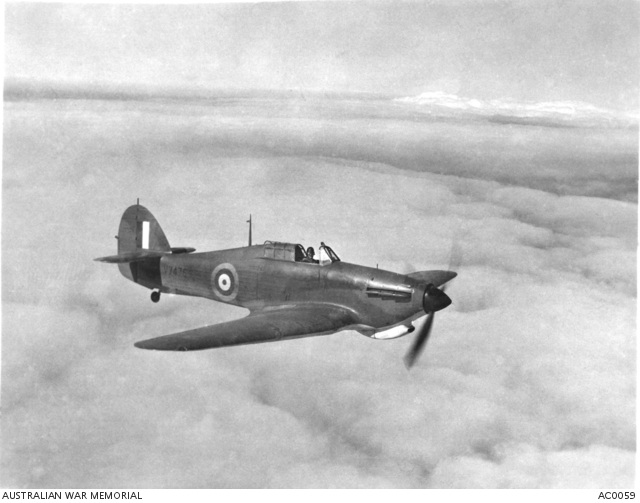 The Hurricane also received Australian national markings. As camouflage colour faded quickly under Australian sun. Sky Blue turned to almost white, also contrast of Foliage Green and Earth Brown faded (Brown faded less). In September 1944 it came back to 1 Aircraft Depot where it stayed until the end of the year and probably was serviced and repainted according to new instruction from May 1944 which required all fighter planes wear no camouflage. Fabric parts were painted silver and paint from metal parts was removed, although according to the instruction appendix it should be painted Foliage Green. V7476 at the end of her sevrice, 1945/46. Note serial number without a bar (as it was when she wore camouflage). In the background is a P.40N, in similar late war livery. Photo from Tony O’Toole collection. There is one more interesting thing in this history. Unlike other aircraft sent to Australia during the war, Hawker Hurricane Mk.I Trop/V7476 never received Australian serial number. It kept its original serial number. Aknowlegements: Tony O’Toole, Ed Russel and Gary Byk, colour profiles by Zbyszek Malicki. 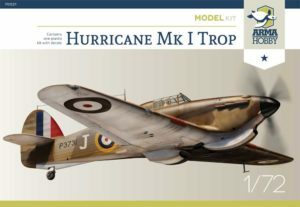 See Hurricane Mk I trop model kit in Arma Hobby internet shop. Box contents decals with markings for three colour schemes, including two Australian. Go to the shop! 26/03/2019 Dominik SędziakHistoryNo Comment	#70021, 1:72, colours and markings, Hurricane.